If you have noticed an unusual amount of questionable third-party web content, it might be an indication that an adware application is fully active on your operating system. One such program is known as AhoyTraveler. In the majority of cases, it is marketed in a devious way, to say the least. Developers of this questionable tool often claim that this application could be useful if you are looking for the best traveling deals out there on the web. By running it on your computer, you should be presented with great discount deals and promotional code. Do not get fooled by these misleading statements since in reality this program will not do anything like that. It will only alter your overall online experience in a negative way. What is even worse is the fact that in some cases this piece of ad-supported software could be the reason your computer might get infected with other questionable applications. It goes without saying that such functionality of this adware program is the main reason we highly advise you to delete it without any hesitation. Follow the detailed removal guide that we provide below to get rid of AhoyTraveler once and for all. AhoyTraveler might, at first, seem like a useful program. This is so because in some cases it could present you with content regarding traveling. Unfortunately, these ads and pop-ups cannot be considered useful. In reality, the web content presented by this ad-supported program will only cause disruptions every single time you decide to surf the web. At times, you might be presented with so many of those unwanted and annoying ads or pop-ups that surfing the web could become virtually impossible. All such activity is possible because this devious program silently connects to dubious adware servers. Such contentions are established with a help of a system service that is started as soon as this adware application enters your operating system. It is important to note that the name of a background system service is often random; thus identifying and killing it could turn out to be a rather difficult task, if you are a non-advanced computer user. What is even worse is the fact that simply ending the intrusive system service via a Task Manager might not be enough to stop the invasive activity of AhoyTraveler entirely. If you wish to surf the web the way you are used to, you need to delete this adware as a whole, meaning that every single bit of it should be terminated from your computer. If you fail to do so, the intrusive activity will continue to annoy you. While invasive activity is the most prominent feature of AhoyTraveler, you must know that there is something much more alarming about this adware than you might think at first. During our investigation, we have found out that in some cases this unwanted program could turn out to act as a gateway into your computer for other suspicious applications. At times, it could connect to the Internet without any authorization and might even trigger a silent download. It goes without saying that such instance is a dangerous one. This is so because it is impossible to determine what kind of program could be downloaded. 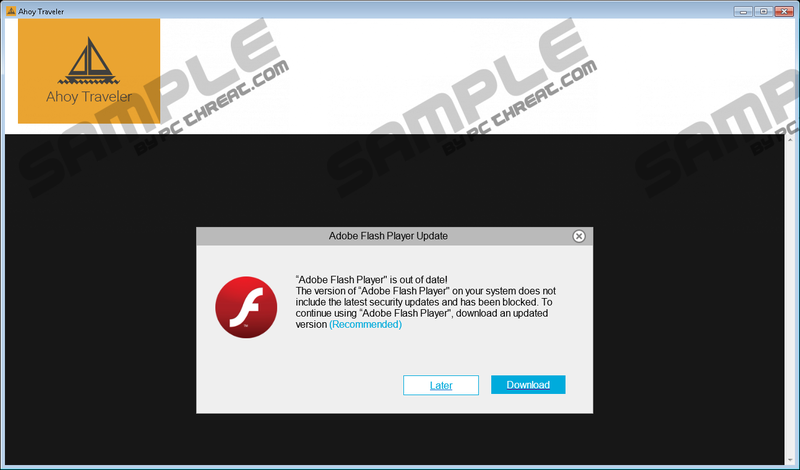 In some cases, this adware could trigger a download of some unknown malicious program. It should be more than obvious that such activity of this invasive application could have disastrous outcomes. In fact, we consider AhoyTraveler a major virtual threat that must be removed to restore the proper virtual security of your operating system. Do not hesitate to use the instructions that we provide below in order to get rid of this intrusive program. AhoyTraveler must be removed at the very same time that it is found up and running on your operating system. Make sure to delete every single bit of this adware program since just a few leftovers linked to it could be used in a dubious way. In some cases, the ad-supported program in question could use just a few leftovers to continue its annoying and potentially malicious functionality. Additionally it could use just a few of its traces in order to silently restore itself. This is why we highly advise you to scan your computer with a reliable antimalware tool once you are done with the manual removal. This way you will be sure that everything associated with AhoyTraveler has been removed from your PC. Select AhoyTraveler and click the Uninstall option. Quick & tested solution for AhoyTraveler removal.